Title: The Barnum & Bailey greatest show on earth The world's largest, grandest, best amusement institution / / The Strobridge Lith. Co., Cinti & New York. Medium: 1 print (poster) : chromolithograph ; 100 x 76 cm. 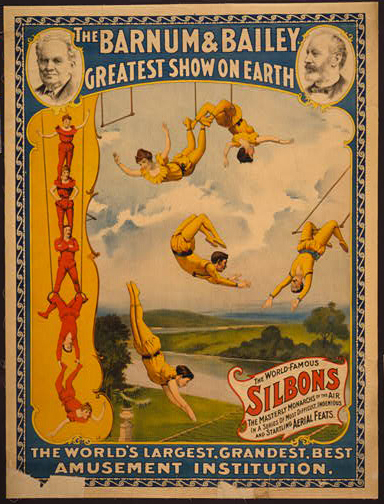 Summary: Circus poster showing trapeze artists. Caption: The world-famous Silbons, the masterly monarchs of the air, in a series of most difficult, ingenious and startling aerial feats. Copyright by The Strobridge Lith. Co., Cinti - New York.